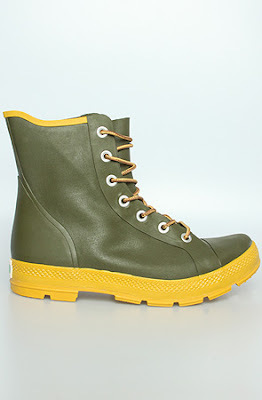 While I usually am against the idea of men in rubber rain boots, Converse has just released images of a great new rain boot which maintains the look and feel of a normal work boot while incorporating the rubber to make it ready for the rainy days ahead. 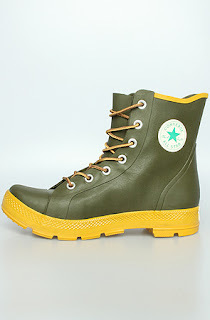 They maintained the classic look and feel expected of any pair of Converse while creating a boot that is a new idea for the brand. With chorded laces, an attached tongue, and a reinforced toe, these boots will have you dry and looking fresh, even on the dreariest of days. You can have them all for yourself for $80 USD at Karmaloop.